Brock Barracks memorial on the wall of the Keep to Frederick William Owen Potts, V.C. 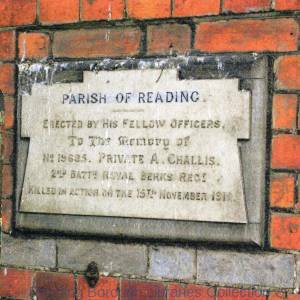 Brock Barracks, Oxford Road, Reading: memorial on the wall of the keep to Frederick William Owen Potts, V.C. ["Trooper Potts], of the Berkshire Yeomanry, the town's only Victoria Cross recipient, who died in 1943. Brock Barracks memorial on the wall of the Keep to Frederick William Owen Potts, VC.